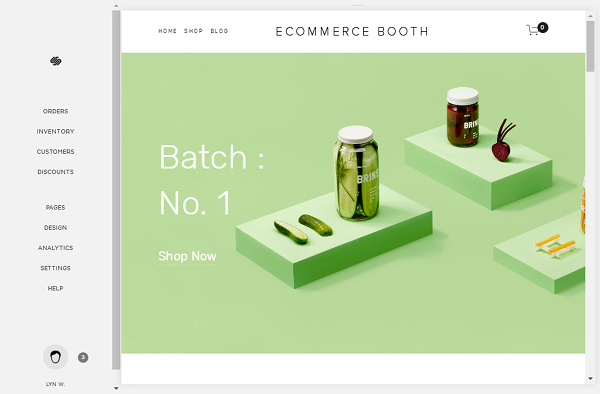 Squarespace has become among the most popular site builders available in the web design industry, and it’s expanded its services far enough for it to become a dedicated eCommerce platform capable of running a fully-fledged online store. The company was “underground,” so to speak, for quite some time before it picked up momentum years after it was founded with smarter marketing tactics, including partnering with popular YouTube personalities and featuring ads during the Super Bowl. Squarespace was founded in 2004 in the dorm room of founder and current CEO Anthony Casalena. The company now has over 580 people working for it, and its platform has been used to build over 1 million websites since it was founded. The company’s core mission is to make building a beautiful, well-designed website as simple as can be and something anyone with rudimentary computer skills can accomplish. It even has an impressive pool of talent to tackle this mission. Let’s see how well they’re accomplishing this feat. Squarespace is a site builder that happens to come with ecommerce features, so let’s take a look at what features it has to offer you as an ecommerce platform. We’ll get to ease of use in the second pro, but first, let’s talk about the simplicity Squarespace brings as an all-in-one solution. What does “all-in-one” mean when it comes to Squarespace? Well, this platform takes care of hosting, web design and other coding needs, security, maintenance, and payment gateways in the form of Stripe, Apple Pay and PayPal. It hosts your site on cloud servers, which gives it the ability to scale as needed to ensure you experience no downtime no matter how much traffic your site gets hit with. It also offers ready-to-use templates you can customize using a point-and-click style editor as well as native blogging capabilities. This platform offers everything you need to set up and host an ecommerce website, and it’s even easy enough to use to the point where anyone, regardless of their skill level in web design, can create and manage their own website. Squarespace is known for their sleek, minimalist template designs, eight of which are available exclusively for ecommerce websites. These designs are available as is. All you need to do is click on an element you want to change to edit its text, image or overall appearance. You can even add new elements. It’s even easy to set up an account. It took me under 2 minutes. Each plan allows you to sell an unlimited number of products, as you can see. However, each one offers different ecommerce features. The two cheapest plans, for example, charge a fee for every transaction your store processes. This is on top of the transaction fee charged by the payment gateway you use. This fee disappears when you purchase the dedicated ecommerce plans. The dedicated ecommerce plans also offer more powerful features as far as online stores go, which we’ll get to throughout this review. 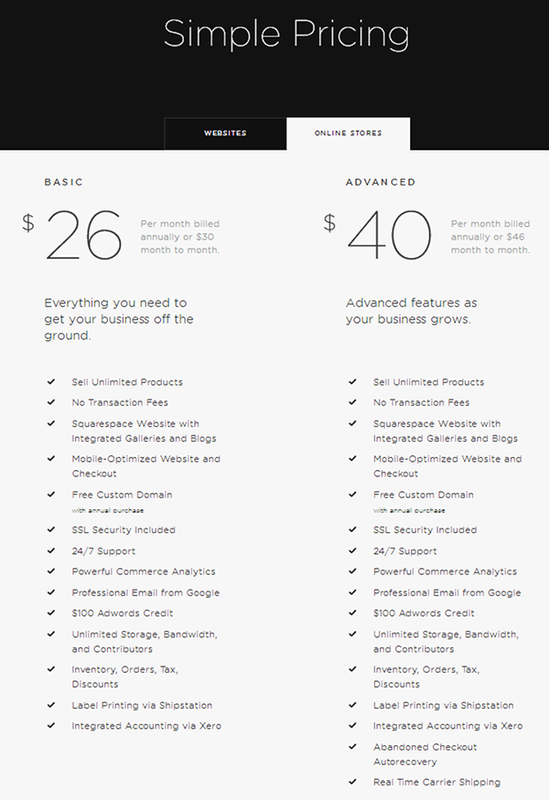 Overall, pricing for Squarespace is pretty decent, especially given the fact that its sites are hosted on cloud servers. They also state how visual most technical issues are and how most customers are asked to provide screenshots to further explain the issues they’re having. This cannot be done over the phone. You can also help yourself and receive help from other Squarespace customers through the platform’s knowledge base, videos, workshops, FAQs, guides and community forums. Squarespace allows you to offer a variety of different shipping options, including pickup, flat rate, weight and country restrictions. The Advanced plan even allows you to display real-time shipping rates from such carriers as USPS, FedEx and UPS. The dedicated ecommerce plans also allow you to integrate your store with ShipStation, a service that makes it easy to manage your store’s shipments and print label shipping labels at your place of business rather than having to wait for your carrier to do them when you drop your packages off. This platform offers a free SSL certificate to protect every page on your site and encrypt checkout pages. It does not, however, allow you to install a custom SSL certificate from a third-party provider. It’s also PCI compliant to add an extra layer of security. Creating new products using the Squarespace interface is tremendously simple to do. You can sell physical and digital products as well as services. In fact, the interface asks you which type of product (Physical, Digital, Service) you’d like to create when you go to create a new product. All of the usual features you’d expect to find on a New Product page of an ecommerce platform are there, including fields for the product’s name, description and price. You can also add images, create product variants complete with a different price for each variant and add additional sections for return policies and other information. 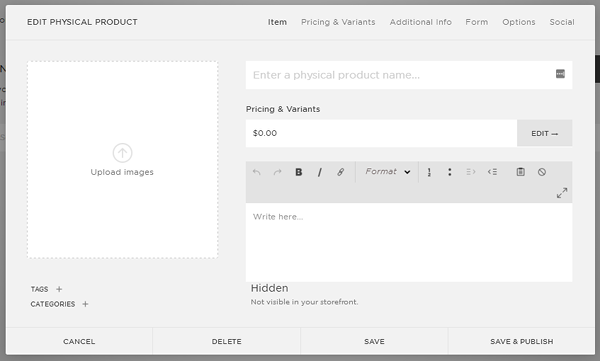 You can also add forms to product pages if you sell custom products, create custom URLs for individual products, create custom Add to Cart and Purchase buttons, and give individual products a Featured label. There are a few features I don’t like with the New Product page, but we’ll get to them in the cons. Lastly for the pros, Squarespace offers powerful analytical data. Not as powerful as some dedicated ecommerce platforms but still enough to give you clear insight into how well your store is performing over a certain period of time. 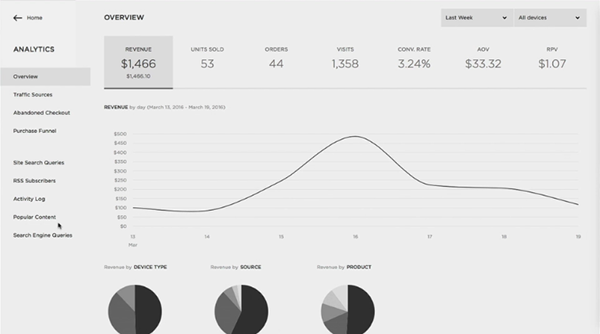 You can view an overview of your revenue, number of units sold, number of orders processed, number of visits received, your conversion rate, your average order value and your revenue per visit. You can also see where your traffic is coming from as well as which search terms visitors are using to get to your store from search engines. Other data the Analytics section lets you keep an eye on are abandoned carts, purchase funnels and your site’s most popular content. Squarespace is a site builder above all, so it’s bound to lack a few features you’re used to seeing in dedicated ecommerce platforms. Let’s see what areas it falls short in. So, if I own an apparel store that sells clothing for men and women, according to Squarespace’s instructions, I would need to create one page called Men’s and another called Women’s. If I sell tops, shoes and bottoms for men, I would need to add my Men’s Tops, Men’s Shoes and Men’s Bottoms categories to the Men’s page and do the same with my women’s categories on the Women’s page. This may not have a huge affect on the way your customers use your store, but it will have an affect on the way you run your store from an administrative perspective as you cannot organize your products properly from the backend of your store. You can, however, use tags liberally. Most ecommerce platforms allow you to create lists of parent options and child options for product variants. For example, If I sell a t-shirt that comes in the colors black, red and white and the sizes small, medium and large, I would create a parent option called Color and add Black, Red and White as options. The other list would be called Size with Small, Medium and Large as options. Squarespace does not allow you to do this. Instead, you need to create a different variant for each product. 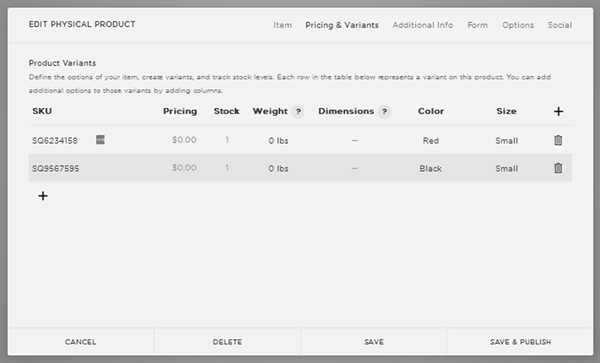 Instead of creating a quick list of options and having the customer select which variant they’d like to purchase using the drop-down menu(s) created on the product page, I have to create one variant that has a color of Black and a size of Small, a second variant with the color of Black and a size of Medium and a third variant with the color of Black and the size of Large. I have to do the same with the colors red and white. The overall process is tedious as is. It would be much more efficient to create simple lists of the colors and sizes my product comes in. Squarespace is missing a few key features that keep it from becoming a powerhouse as far as ecommerce goes. One of these features is its lack of detailed sales reports, customer reports and data on specific elements, such as most-purchased products, which customers are most valuable to your store, etc. Apart from ShipStation, Xero and a few payment gateways, Squarespace offers few apps and integrations. This is another missing feature that prevents it from being a competitor to platforms like Shopify, a platform that has over 1,000 apps and integrations. It’s also a missing feature that will keep you from adding unique functionalities to your store as you see fit. Squarespace is not a dedicated ecommerce platform. The ecommerce features mentioned in this review are meant to complement its site-building elements. This means it’s not powerful enough to be a direct competitor of platforms like Shopify and BigCommerce, so I recommend looking elsewhere if you run a larger ecommerce site filled with custom code and unique functionalities. If run a small to medium-sized business or plan to grow your store to a moderate size slowly, give Squarespace a try, starting with its no-obligation, 14-day free trial.